Discussion in 'Emergency Care - 911.' started by Savannah-02, Dec 18, 2015. Savannah-02 Hi, I'm New Here! Did your molting crab go limp? Please don't assume it's dead until absolutely positive because sometimes a molting crab can go limp and not show signs of life, but it doesn't mean they're actually dead. Crabs preparing for molting can go limp and appear dead it is perfectly normal and you can only assume it's dead when it starts to smell. The picture above can give an idea f how a limp crab can look like, pretty lifeless. 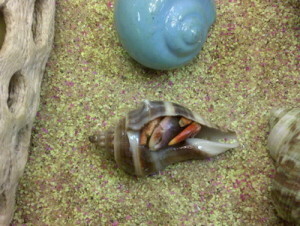 That's a perfect representation of a limp hermit crab.